Description: Sable Island, a narrow, crescent-shaped island approximately 290kms (180 miles) southeast of Halifax, is home to a population of about 500 feral horses. These short, stocky horses stand between 13 and 14 hands (1.3-1.4m) in height and weigh between 300 and 360kgs (660-790lbs). Sable Island Horses have dark shaggy coats, manes, and tails. The famous Sable Island Horses are thought to be descended from livestock Thomas Hancock of Boston sent to the Island in 1760. It is believed that horses had originally belonged to Acadian settlers who were deported by the British between 1755 and 1764 and whose assets were subsequently seized. 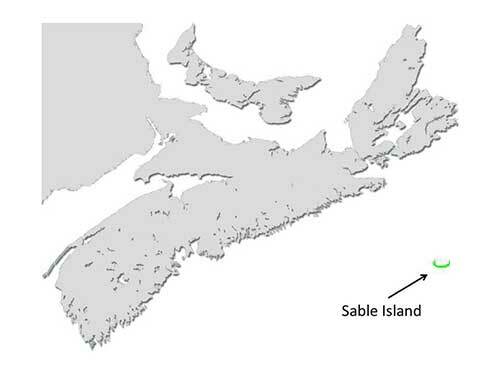 Distribution and Habitat: Sable Island horses are found only on Sable Island and live in a coastal, marram grass and sand dune environment with harsh winters. Other than on Sable Island, the Shubenacadie Provincial Wildlife Park is the only places in the world where a person can see these sturdy little horses. In 1960, the Federal Crown Assets Disposal Corporation put these horses up for sale. It was believed they were stunted due to inbreeding and lack of food. The horses were to be taken off Sable Island before they starved to death and used for something functional, such as dog food or glue. Many children wrote to then Prime Minister John Diefenbaker, who intervened and prevented any human interference with the horses. Diet: Herbivores, Sable Island horses primarily eat grasses. Life Cycle: The once domesticated horses have returned to the natural horse social system of small herds, each defended by a stallion and led by an older herd mare. Each herd has a range of about 3 square kms, with 40 to 50 herds on the Island. When winter arrives, bringing with it snow and freezing rain, the herd mare huddles the herd close together for warmth. The population is characterized by rapid growth, interrupted by periodic crashes every few years. After several mild winters, the population will increase, but many old or very young horses will die during the next normally harsh winter. 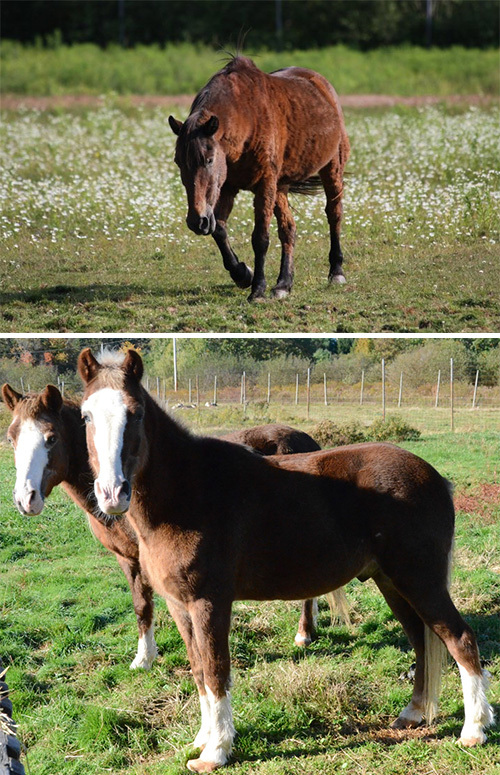 Adaptations: Like other horses that live outside during cold weather, Sable Island horses grow thick, woolly coats. They have learned to search out protection in the hollows between the sand dunes during nasty weather. Did you know? In 2013 Sable Island became a National Park Reserve ensuring its protection as a natural space under Canada’s National Park Legislation.